Sir Dr Chief Gabriel Osawaru Igbinedion, Esama of Benin State in Nigeria and seven other personalities were on Saturday November 26, 2011 awarded Honorary Doctorate Degrees for their meritorious services to humanity, educational development and philanthropic deeds. This was at a special congregation organized by the Kwame Nkrumah University of Science and Technology (KNUST) to climax the commemoration of its 60 years anniversary. The other awardees were James Wolfenson, former Managing Director of World Bank, His Eminence Peter Cardinal Appiah Turkson, President of the Pontifical Council for Justice and Peace at the Vatican, Rome, Mr Paul Effah, an educationist, and Mr K. Frimpong, Chief Executive Officer (CEO) of Champion Divine Clinic. The rest were Mr Joseph Siaw Agyepong, CEO of Zoomlion Ghana Limited, Professor Imelda Bates, a Scientist, and Professor Naresh Thevathasan, a Researcher and Scientist. The well-patronized programme had in attendance former President John Agyekum Kufuor and a host of dignitaries from academia, clergy and all walks of life. A citation accompanying the award given to Cardinal Turkson read in part: You have served your church and nation with dignity and devotion, propelling you to greater heights in life. By dint of hard work, you have over the years rendered useful services as a priest and Statesman at the local, national and international levels. 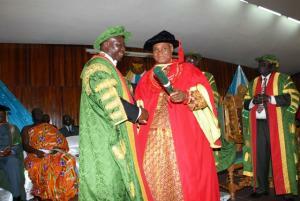 The KNUST salutes you and on the occasion of its 60 years anniversary confers on you this Honorary Degree. Otumfuo Osei Tutu 11, Asantehene and Chancellor of the KNUST, said by the awards the University had made a public recognition and manifestation of the respective achievements of the recipients. He lauded the award winners for their dedication to the cause of mankind and hoped they would not relent in their efforts to serve humanity. We ask for your continued support to your respective causes and to make your lives an example of excellence to the youth, the Asantehene observed. Sir Dr Chief Igbinedion thanked the University for honouring the award winners and said this would propel them to strive for excellence in their endeavours. He stressed that university education was universal and that the KNUST should foster closer collaboration with their other sister universities abroad to share ideas and experiences.